Box jellyfish are a highly dangerous invertebrates species. Aptly named with a cube-shaped body structure and long trailing tentacles, several species of the box jellyfish are extremely venomous, including the Carukia barnesi, Malo kingi, and Chironex Fleckeri. Box Jellyfish are fast swimmers too. 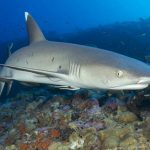 They are capable of achieving speeds of up to 1.5 to 2 metres per second, or about 4 knots (7.4 km/h; 4.6 mph), which is faster than most humans can swim; certainly children, anyway. The average sprinting speed among humans is 1.64 meters per second. Their body structures are also complex: They have a well designed nervous system that enables them to move quickly, a brain-like structure, and twenty four eyes that can detect the difference between light and dark. Unlike most jellyfish, the box are fairly adept at navigating around obstacles and swimming swiftly to a desired location. They can reach up to 10 feet in length, owing to their long tentacles, and can weigh up to 4.5 pounds. A Chironex Fleckeri can be identified by its tentacles, which trail distinctively from its body. How Dangerous Are Box Jellyfish? Box jellyfish have long been touted as one of- if not the most- venomous creature in the world, though it’s important to note that some species of box jellyfish leave a sting that is fairly mild. The species we are concerned with is the Chironex fleckeri (pictured above), which has been responsible for more than 60 deaths in Australia in the past hundred years. In Thailand, there have been 15 serious cases recorded between 1997 and 2015 (the majority attributed to (Chironex fleckeri), though many cases of smaller sting incidents have gone unreported (officially), and indeed many stings are wrongly not attributed to the box jellyfish. 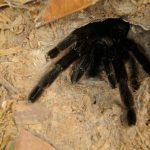 The venom from the Chironex fleckeri is powerful enough to degrade cell walls, causing them to leak potassium, a condition called hyperkalemia. Hyperkalemia is an assault on the cardiovascular system and often results in a collapse, and then death, all within a 5 minute time period. The serious bodily damage caused by this jellyfish can be mitigated by proper beach netting and immediate use of vinegar as a first aid solution. Though sadly these simple safety precautions are often neglected. Chironex fleckeri stings are also particularly dangerous because it can be difficult to identify a sting until after the jellyfish’s venom has spread. In addition, the box species is hard to spot because of their transparency in shallow water. The islands of Koh Samui and Koh Phangan have the highest incidence of fatal and near fatal box jellyfish cases in Thailand. 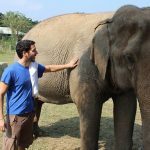 Among eleven cases with information of place of incidence, eight cases (53.3 %) occurred on Koh Samui and another six cases (40 %) occurred on Koh Phangan. One case did not occur on the beach; that of a man who took off his wet suit on a boat after diving and was stung on his left elbow by a tentacle attached to the wet suit. East Rin beach of Koh Phangan (27.3 %), Chawang beach of Koh Samui (27.3 %), and Bo Phut of Koh Samui (18.2 %). Two cases occurred on Lamai beach of Koh Samui, and Khuat beach of Koh Phangan. Thailand’s Andaman Coast, which sees much deeper water, is considered to be the safer in terms of jellyfish activity. However, both Hua Hin and Cha-am do suffer serious jellyfish influx during the wet season. One serious sting incident is pictured later on in this article. More box jellyfish appear during Thailand’s wet monsoon season, owing to the increased activity of the ocean and the changing winds that bring these jellyfish closer to the shoreline, where swimmers are more likely to be. This season runs from May/June through October, with the most rain in August, September and the beginning of October. If we look at the 15 officially documented and analysed cases since 1997: The highest incidence by month was August (33.3 %), September and October (20%), and July (13.3 %). Eight cases occurred on Samui (53.3 %), 6 cases on Koh Phangan island (40%), and one case on a boat. Avoiding the Gulf during this season is an easy way to avoid the threat of box jellyfish. In addition, tourists should steer clear of any jellyfish washed up onto the beaches as they still have the potential to inflict a painful, and even deadly, sting. While the majority of stings (and fatalities) occur in the Gulf of Thailand, two stinging incidents occurred in Koh Lanta- on Thailand’s Andaman Coast- during the month of May (2017). This highlights the need for tourist education and an action plan on beaches everywhere in Thailand. The victims were all tourists, except one – a local Thai woman named Ms Chaiyanun Surin. Does Vinegar Work for Box Jellyfish Stings? When analysing the use of vinegar in the aforementioned cases: of six fatal cases, only one had vinegar poured on the injury. Among six surviving cases, three received the vinegar treatment. One received vinegar as first aid at the hospital after 10–15 min being stung. The jury is somewhat out on just how effective vinegar is, but the statistics appear to show a slightly higher chance of survival if vinegar is applied to the victim within a few minutes of being stung. A 26 year old American woman stung by a box jellyfish on September 3rd 2010 at a beach on Pha-ngan island. She lost consciousness and was revived following resuscitation. Vinegar was applied. Immobilize/splint the stung area and keep it at heart level [gravity-neutral] if possible. Note: sting victims should not drink alcohol, take medicine or eat any food. Seek medical treatment as quickly as possible or apply anti-venom if available. In instances of severe stinging, CPR might be needed as the swimmer might go into anaphylactic shock. – Don’t panic; try to keep a level head and get the sting victim out of the water. – Have someone call emergency services and prepare to take the swimmer to a clinic or an emergency room. – If possible, find vinegar right away. Though some beaches in Thailand (and most in Australia) are equipped with vinegar stands, there is still the possibility that vinegar may be hard to find. 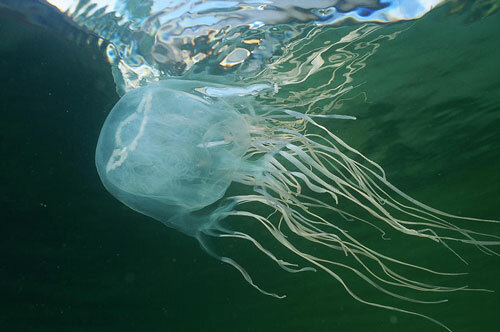 In a recent stinging case in March of this year, a mother had to solicit beachside restaurants for vinegar to use on her son, who had been stung by a box jellyfish. – Keep the victim calm and apply a steady stream of vinegar for 30-60 seconds. After, gently (with a stick or a covered hand) remove any remaining tentacles. Try not to scrape them away, as this will cause more venom to be released. 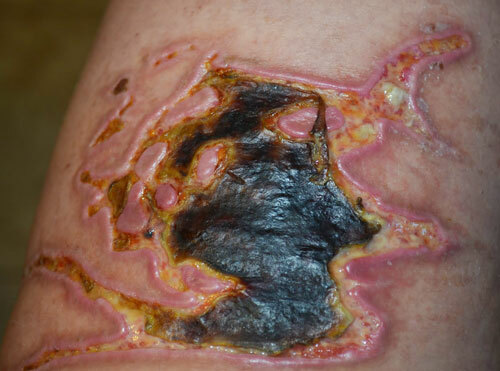 If available, submerge the affected area in hot water or get the victim into a hot shower. If anti-venom is available, use it immediately. Warm shallow waters with sandy bottoms seem to attract box jellyfish, and an overwhelming consensus is that they are quite active when the sun goes down. Avoid swims at dusk or at night. Note that jellyfish sting prevention lotion has not been actively tested on venomous jellyfish stings and is probably not worth the purchase. Lycra swimming/dive suits are a good choice for protection, and there are now dedicated stinger suits available. Wetsuits, Dive Suits and Drysuits: suitable for water temperature between -2 and 25°C or 28 to 77°F. The suits are both effective and cover arms and legs to the wrists and ankles. It is definitely worth considering suits for children in particular as they are more vulnerable in terms of being able to sport the danger and withstand the sting. The active maintenance of vinegar stands on Thai beaches is another excellent way to mitigate the effects of a jellyfish sting. 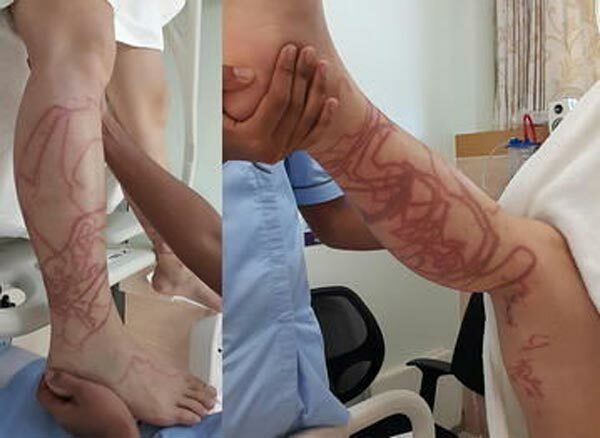 Those who are injured by box jellyfish and treated quickly with vinegar have a statistically higher chance of survival and will suffer a lower degree of pain and scarring. Check that the beach vinegar stand has a full bottle, and better still, take your own! Unfortunately, even if sting victims are able to receive immediate medical attention, there is still the chance that rural emergency clinics are not up-to-date with the latest science on treating stings. You will need post trauma treatment too, which is essential for a full recovery. 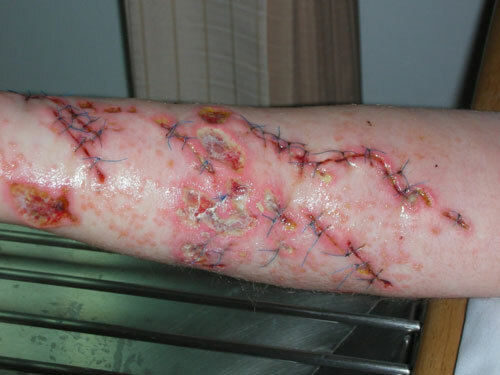 One victim in Thailand in 2008 received inadequate stitching as a response to his horrible stings. As a result, he is still dealing with the repercussions of this botched medical procedure today. With this in mind, make sure you travel with comprehensive medical insurance. This will ensure that you have the ability to be seen at a top hospital with top surgeons, or even a plastic surgeon if you need a skin graft. If a loved one has been badly injured by jellyfish, stay on guard throughout the entirety of the process. Shannon Leone Fowler’s novel, Traveling With Ghosts, tells the devastating story of losing her fiancé on a beach in Thailand after the pair went for a sunset swim and he was stung. After Sean, her fiancé, was transported to a Thai hospital and later died, Shannon was forced to sign documents that weren’t adequately translated for her and that pinned responsibility for Sean’s death on a drunken drowning- a statement that was both unfair and untrue. Be sure to insist upon comprehensive information and translation should you be admitted into a Thai hospital. A 31 year old Chinese man stung on September 12th 2015 at Chaweng beach, Samui island. He lost consciousness & received vinegar & cardiopulmonary resuscitation at the hospital (10–15 min after being stung). He was admitted into Intensive Care Unit and put on a respirator. Remember: Box jellyfish stings are rare, so don't be fearful – but they can happen. Follow the precautions in this post and enjoy your holiday. Got stung on my arm (1-2cm) and my wife on the neck in Koh Lanta in april for our first bath here a few years ago, probably a piece of tentacle from a jelly fish cut in pieces by the near boats propeller...There was no vinegar at the resorts kitchen so I had to rush to the nearest Seven a few hundred meters away...There was no visible remains but I used a rasor to scrap the area after applying the vinegar.Hopefully it was really small because despite it was looking insignificant, beside the sense of skin tightness, burning and redness, I did not felt very well after a while.I prefer to stay on the shore now. Ouch! Close call. It is a concern. I've got my daughter a UV wetsuit and only let her go paddling. In northern Australia where there are various stinging jelly fish, beaches have 1 litre bottles of vinegar in special stands every few hundred metres. I was stung by two biz jelly fish and I can well say that it was a near death experience. I was saved due to availability of Vinegar at the hotel. I could barely breath. This happened to me on 19th of August 2018 at Koh Samui. Just don’t enter sea water without stinger suit . If you want to know more write to me nataura@gmail.com I can send photographs. I was stung by what I believe was a box jellyfish on Samui in August of 2013. There was no vinegar and no warning signs. Fortunately the tentacle contact was relatively minor, only a single tentacle maybe about 50-60 cm or so across my back. Very painful. Had to buy vinegar at a local shop to treat it, which helped tremendously, as did a hot shower afterwards. Was able to laugh about it by the end of the day and never reported it, but after later reading about all the fatal box jellyfish stings on Samui and Phangnaan, I realize I was very lucky. Wow, that was a close call. Have you any idea what type it was? Did it leave a scar? Where were you swimming, shallow or deep water? And what time of day?